Hordeum murinum. Roberto Garavaglia.The Observations of a Naturalist.www.neorurale.net (Accessed 5/2014). Hordeum murinum is an annual C3 grass (Waller and Lewis 1979), to 40 cm tall, upper margin of sheath with lobes about 0.3 cm, ligule truncate, membranous. Leaves flat, 0.2-0.5 cm wide, prominent, ear-shaped extensions (auricles) at tops of sheaths. Flower spikelets in sets of 3, only the central one fertile, glumes of central spikelet to 0.2 cm, outer glumes of lateral spikelets awn-like, fertile lemma 0.7-1 cm long, those of lateral spikelets to 2 cm, all lemmas awned from tip, awns stout, flattened 2-3 cm long. 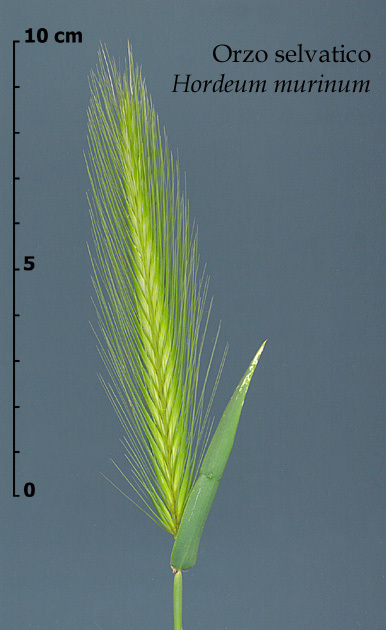 inflorescence spike 4-7 cm long, (excluding awns), often partly enclosed in sheath.